With all the ridiculous problems Universal's monster movie revival The Wolfman, including flip-flopping back to Danny Elfman's original score for the film, everyone here at FirstShowing is ready for the film to be released already so we can just see if it's a disaster or not. But while we're waiting for it to hit theaters next month Bloody-Disgusting gives us an obligatory look at the final poster for the film which has an infamous floating head design. While the poster is nowhere as special as Basil Gogos' painted Wolfman poster, it gives us one final ominous look at the monster himself in his usual stalking grounds of the dark woods. Check it! The Wolfman is directed by best visual effects Oscar winner Joe Johnston, of Honey I Shrunk the Kids, The Rocketeer, Jumanji, October Sky, Jurassic Park III, and Hidalgo previously. The screenplay was co-written by Andrew Kevin Walker (Se7en, 8MM, Sleepy Hollow) and David Self (The Haunting, Thirteen Days, Road to Perdition). 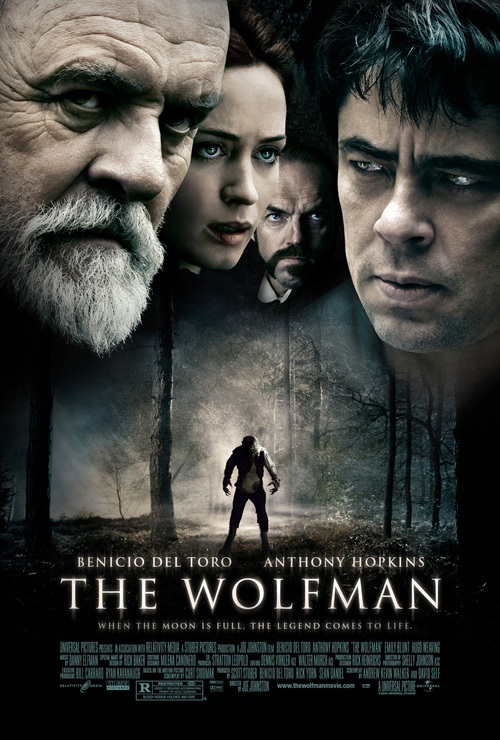 Universal will be bringing The Wolfman to theaters on February 12th in just under a month. Meh....I liked all the previous posters for this movie better. For a brief moment, I had an episode of dyslexia and read 'fog' as 'frog'! Come to think of it, that silhouette of the Wolf Man does look like a frog! the posters are getting worst each time they put out new one. Let's find out if the wolfman's got any teeth in him. Would have been better without the floating heads.....but only slightly better. the poster seems ok, but posters don't make a movie. the tv trailer i keep seeing makes the movie look really good. ^ I hear you on that, it does look pretty promising doesnt it?! But it would be nice to see some more thought on the poster and posters in general but there you go! dont care about the poster....but i think it will be a very good movie!!! !cant wait!!! Why's Danny Elfmans name still on the poster? I thought he didn't score the movie anymore.